Refugees are all kinds, but real are only those that adhere truth in respect to persecution. Not economic or even foreign agents can be classified ad such(real). What we have in this center are KGB "refugees"(political in game for own gains and are used to break/destroy those which immigrated due to break neeeds) and semi economic(used by Germany for Germany interests - why to be in Poland if praising Germany above all). Immigration has changed and UN is nothing more than name left of organisation which once used to represent something. With immigration like this, every country should be concerned as one effects country's souverenity big time. Poland’s Prime Minister Mateusz Morawiecki yesterday revealed that it is “very likely” the country will back out from the Global Compact for Migration. Poland follows the United States, Austria, Hungary and the Czech Republic in abandoning the plan. 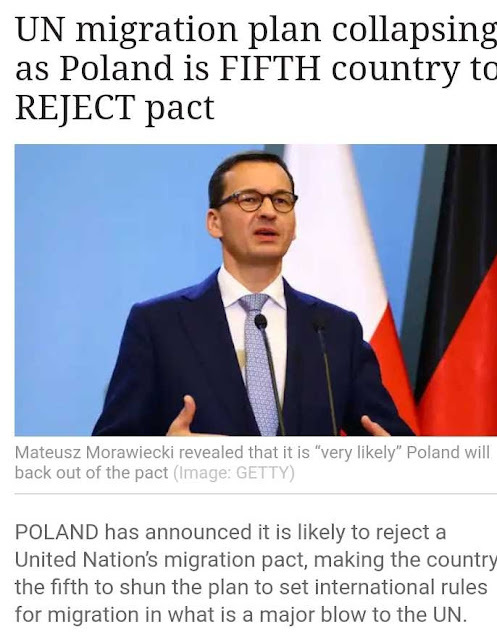 Mr Morawiecki said Poland was assessing the pact, which is due to be implemented next month, but added its own migration controls are its priority.